There have been many really good user interface ideas and suggestions for working with microformats. This page collects and document them so that we may be inspired by and iterate on each others' works. Design based on actions, not data. A button that says "Send to Calendar" is considerably more useable than a green button that simply says "hCalendar"
Use iconic images instead of acronyms. In addition to being more descriptive, they localize better. Here are some I've been showing in various talks: microformat icons. These are still very preliminary. Mozilla will likely release all of the source artwork for our microformat icons under a creative commons license around the launch of Firefox 3. This will enable Web designers to integrate the icons into their sites, and other Web browsers can consider using a similar set of icons. Chris Messina: "What kind of solutions can we come up with that are single click only?" Alex Faaborg: Mozilla has had inquiries from reporters in the mainstream media (Wired and Business Week) who wanted to cover microformats in stories about the future of the Web browser, but they then later backed out because they felt the term "microformats" would only appeal to developers, and not the average reader. These types of mainstream stories need to focus on the user experience, and not the underlying technology, but what term should reporters use to describe the overall feature? See the separate social-network-portability page. From visions to screenshot brainstorms to working plugins to shipping implementations, there is a lot going on with browser integration of microformats support. 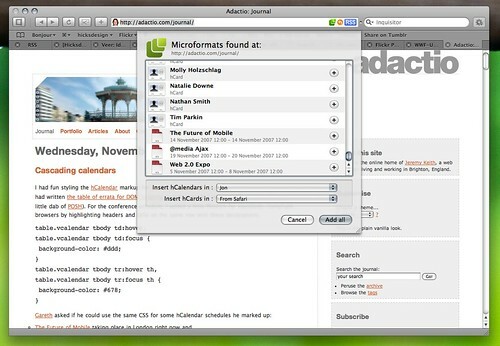 The Flock browser ships with microformats support built-in. - This has not been confirmed. -- Chris Messina. An Internet Explorer add-on provided by Microsoft supports microformats. Firefox version 3.0 has support similar to Operator built-in. See the Firefox page for details. Parse them into a set of microformats for that page (preferably maintaining their relative relationships perhaps within a tree structure). API. Provide an API (DOM extensions on "document" object?) to access those microformats for browser extension developers. Cache. cache that set/tree of parsed microformats along with the URL/Title/date-accessed of the page in the browser navigation "History" or even page cache, and then use that set of objects for various auto-complete/auto-fill uses and other enhancements to existing browser features. Browsers can indicate the presence of microformats on a page in several ways. Examples and ideas for tools to author microformats within CMS tools. It would be nice to have a bookmarklet that you can just hit on a selected bit of text in a textarea or WYSIWYG editor to turn into an hcard with just FN, and not have to fill out a form. Whilst this doesn't give us rich information, it's really easy and doesn't create much extra work burden. Some examples of additional user interface for common actions to take with microformats found in pages, grouped by specific microformat. Note that most of these use cases should be applicable to all instances of the microformat on the page at once (e.g. export all contacts), or for a selection of instances (e.g. export selected contacts), or one just one specific instance (e.g. 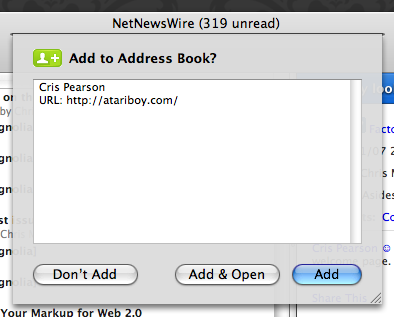 export contact XYZ). "Add to Calendar" (convert the hCalendar events to iCalendar vEvents (.ics) and pass them onto the OS to automatically open/incorporate into the user's preferred local calendaring application). "Subscribe to Calendar" - construct and pass on a conversion URL (e.g. using X2V, or prefixing the URL to the current page (or to the specific event within using a fragment identifier) with webcal://h2vx.com/ics/ ) and pass it onto the OS to get the OS to pass the URL onto the user's preferred local calendaring application for that app to subscribe to. export as text/ comma-separated-values (CSV) to allow editing, sorting and/ or import into spreadsheets/ databases, etc. (or concatenate to existing file). send (in suitable format) via bluetooth to GPS device. what if user goes to permalink of a blog post and that has just one static hentry - does subscribe make sense? wouldn't it be better if the default subscribe verb in that context subscribed to the blog home page? or if user goes to an archive page which just has a set of static hentry items - again, how does subscribe help? 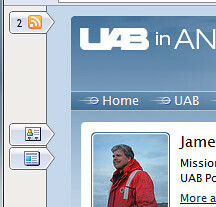 wouldn't it be better if the default subscribe verb in that context subscribed to the blog home page? possible solution: using a combination of rel-home and rel-archive (one of several already widely deployed existing-rel-values in WordPress and other blogging-tools), it may be possible to identify the home page of a blog from a post permalink or archive page, or vice versa, and thus enable a smarter "subscribe to this blog" functionality. Discussion and mockups / screenshots of additional user interface for microformats (some screenshots are only available at the destination links, please click through). See implementations, and document examples of good UI from there, here. Tails Export (Firefox extension) by Robert de Bruin can display and export some microformats. Jon Hicks has written a user stylesheet for Mac browsers that highlights hCard and hCalendar data. There are plenty of wiki-formats that attempt to make it easier for more people author semantic markup, often with textually decorative punctuation. As these simpler markup languages are something that *users* are expected to type, they are user interface. See Markdown and the hCal microformat which proposes an extension to the Markdown text markup language to capture and represent hCalendar event semantics in a human editable form.